The Glass Anemone Aiptasia pulchella is just one of several Aiptasia species, but it is the one aquarists generally refer to as the 'Aiptasia.' There are currently 13 species of Aiptasia. They are often dubbed as "glass anemones" due to their bodies being somewhat translucent, and "rock anemones" because their natural habitat is along rocky shorelines. None of these small Aiptasia anemones have a very good reputation with saltwater hobbyists. They can reach plague proportions in the aquarium or a reef tank, wreak havoc on the other inhabitants, and are difficult to remove. Scientific studies have determined that the glass anemones have strong stings, and don’t “play nice” with other corals and fish. They use venomous cells, nematocyst found in their tentacles, to sting corals and fish. They are very hard to get rid of and have been known to take over a reef aquarium by quickly reproducing while stinging and killing other tank invertebrates. Corals and other anemones are the invertebrates most affected by this pest. Unless you are keeping them in a refugium to help control nutrients, Glass Anemones need to be removed as soon as possible. Once Aiptasia gets a foothold, manual removal to keep populations in check may very well become an ongoing activity. Although Aiptasia are not relished in saltwater aquarium industry, they are favored in the world of research. The Glass Anemone's fame, along with the Brown Glass Anemone, comes form its contribution to the understanding of coral bleaching. It is a hermatypic anemone, meaning that it contains and depends upon zooxanthellae (algae) for nutrients. It is being used in experimental modeling studies to understand how the stress of increased water temperatures affects this symbiotic relationship. Hopes are to learn how environmental causes of bleaching are linked to climate change and disease. 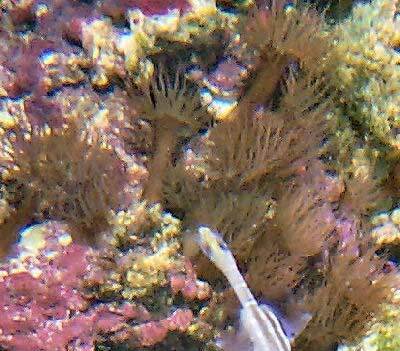 Other Aiptasia being used in various types of research include the Small Rock Anemone Aiptasia diaphana. The Glass Anemone Aiptasia pulchella was described by Carlgren in 1943. It is is found in the North Western Pacific east to Hawaii. This anemone is not on the IUCN Red List for endangered species. This Aiptasia is the rock anemone species that is commonly just called 'Aiptasia'. A few other common names it is known as are Tropical Sea Anemone, Hawaiian Aiptasia pulchella, Rock Anemone, and Tube Anemone. The Aiptasia genus is a member of the Aiptasiidae family and currently contains 12 species. General common names all the various Aiptasia anemones are known by are Aiptasia, Glassrose Anemone, Rock Anemone, Devil's Plague, Aiptasia Anemone, Pest Anemone, and sometimes by this misspelling, Aptasia. Glass Anemones are found in shallow waters along protected coasts and along intertidal rocky shorelines. They are often found alone attached to rubble, live rock, dead corals, and other hard substrates. Glass Anemones also form dense colonies in areas of shallow water, sometimes so dense they look like solid sheets. They occur in deep water too, where there is good tidal action. They generally eat zooplankton, but will always accept other foot particles. Predators are True Peppermint Shrimp, Berghia Nudibranchs and butterflyfish including the relatively reef safe Copperbanded Butterflyfish Chelmon rostratus. The Glass Anemone can get up to about 2.5" (6 cm) tall, but most specimens only reach about 1” (2.5 cm) tall. It is unknown how long Aiptasia anemones can live, but they do reproduce quickly. Mature specimens can produce dozens of juveniles in a single day if they have plenty of nutrients. A. pulchella are somewhat translucent and generally occur in a pale-to-rich brownish color with lighter tentacle tips. The color comes from an algae called zooxanthellae living in its tissues. Their body form is the polyp. It is composed of a long, thin column with an oral disc on top that has a mouth in the center. There are elongated tapering tentacles positioned in narrow rings on the outer margin of the oral disc. The oral disc supporting these tentacles is about 1 inch (2.5 cm) wide. If it feels threatened, quick as a whip, the Glass Anemone will rapidly retract its tentacles becoming a very small ball, and it will retract into its hole or crevice. The Glass Anemone has a pedal disc or 'foot' with which it attaches to the substrate. If tank conditions are not ideal they will use their “foot” to move along the substrate. They do this by contracting the circular muscles of the foot and pushing forward, or they may crawl on their side, moving about 4 cm per hour. Aiptasia pulchella will often opt to simply disconnect and float around, or swim by moving in a spiral motion, until they find a new spot to adhere too. Size of organism - inches: 2.5 inches (6.35 cm) - Most specimens only reach about 1" (2.5 cm) tall. Lifespan: 0 years - Unknown. The Aiptasia, or Glass Anemones, are easy to care for as they are quite hardy and durable. They have the ability to reproduce rapidly in saltwater aquariums where there are plenty of nutrients and good lighting. Some aquarists use aiptasia in their refugiums to take out nutrients from the water. Keeping them in a screened off area of the refugium, they will feed on excess nutrients, thus improving water quality. The number of Aiptasia or Glass Anemones can reach plague proportions in captivity. In some aquariums they will reproduce faster than in others, but the exact reason is unknown. They do seem to reproduce faster in environments high in nutrients and detritus. This anemone, as well as any species of Aiptasia, is generally regarded as a pest. They can be difficult to control and/or eliminate once they get a foothold. The Glass Anemone is a carnivore, but these anemones are also equipped with nutritional alternatives for their well-being. In the wild Aiptasia derive nutrition from their symbiotic algae, zooxanthellae, as well as from the water around them. They use their tentacles to capture organic matter that floats by, then insert the food into their mouths for ingestion. They generally eat zooplankton, but will always accept other foot particles. Do water changes of 10% monthly or 20% every other month. They will flourish in poor water-quality environments that are rich in organic nutrients. For most anemones, typical water changes are 10% twice a month or 20% a monthly, but with Aiptasia, the more nutrients there are, the happier it will be. Due to the small size of the Glass Anemone, it can readily be kept in a nano tank of just 1-gallon or more, however, the tank should be completely cycled. The typical reef environment is best for these anemones. Like most anemone species, they need live rock or some other solid material they can attach to. Any substrate is fine as these anemones will inhabit all levels of the tank. They need the same type of lighting found in a typical reef, and moderate lighting is suggested. They will thrive in bright light, but even under poor lighting aiptasia anemones will survive. They prefer a low-to-moderate water movement, but any type of movement is fine, just not stagnant water. Using aiptasia in refugiums to take out nutrients can be effective, yet it can also be risky if any parts of an aiptasia migrates to the main tank. In a refugium, use screening to prevent free floating aiptasia from migrating to your main tank. Be sure to have all of your pumps covered. Most good quality pumps have guards on them. Lighting Needs: Any - They will thrive in bright light, but even under poor lighting aiptasia anemones will survive. Temperature: 68.0 to 86.0° F (20.0 to 30.0° C) - Has been known to endure wider ranges of temperatures than these. Water Movement: Any - Prefers a lower flow, but will tolerate any movement, just not stagnant water. The Glass Anemones have strong stings that can harm, and even kill other corals and fish. Because they are aggressive, ideally, they are best kept in their own tank. Saltwater hobbyists don't purchase these anemones, rather they are acquired accidentally as "hitch-hikers" on live rock or with other corals. They are very hard to get rid of and have been known to take over a reef aquarium. They can reproduce quickly and will tolerate their own kind, but they are able to out compete other species in the reef tank. When disturbed they eject dangerous white stinging threads, or acontia. Also, by using the venomous cells, the nematocyst found in their tentacles, they sting and push other inhabitants away from their “turf.” They don't host clownfish. Predators are True Peppermint Shrimp, Berghia Nudibranchs and butterflyfish including the relatively reef safe Copperbanded Butterflyfish Chelmon rostratus. No sexual difference in appearance is known. However, studies of Exaiptasia pallida and Aiptasia pulchella have determined that individuals are dioecious, meaning that individuals are of separate sexes. Propagating aiptasia anemones is fairly easy, just feed it and it will multiply. Anemones in general can multiply by sexual and asexual means. Aiptasia will multiply asexually by fission, which is where a tiny bit of tissue detached from the foot quickly develops into a new and complete anemone. Aiptasia anemones will tolerate their own “clones”, and these anemones are very prolific. This is why it is very difficult to physically remove these anemones from a rock. Any remaining tissues quickly multiply into to new specimens. Sexual reproduction has not been described for the species. Glass Anemones are durable and problems are pretty minimal unless your lighting, water movement, and feeding is inadequate. Then your anemone will detach to look for “better conditions.” With better conditions, they can quickly multiply. Having a quickly expanding population of Aiptasia then becomes the problem. Regular and time consuming manual removal is often required so that an aquarium is not overrun by dense populations of Aiptasia. There are various ways to reduce and control aiptasia populations. Sea anemone predators provides a natural, biological method of controlling and possibly eliminating Aiptasia anemones. Other methods include chemical removal and the more risky method of physical removal. There are important considerations when using either of these two methods. For information on Aiptasia removal and control, see: Aiptasia Pests - Getting Rid of Glass Anemones. Saltwater aquarists don't usually buy Glass Anemones, but Aiptasia is available alive from supply companies for research and scientific study. Aquarists generally acquire them as hitchhikers, arriving with live rock or attached to the base of corals.